GPAX, Inc.’s product through internet research. Their project required the automated assembly of a nominally heavy valve spool with a special finish. In order to protect the finish and automate the assembly, the OEM wanted the part to come off of the manufacturing line and to be loaded carefully in to packaging so it would protect during shipping. GPAX modified its mechanically interlocking cover and carrier tape to support this requirement. The tapes were interlocked first. 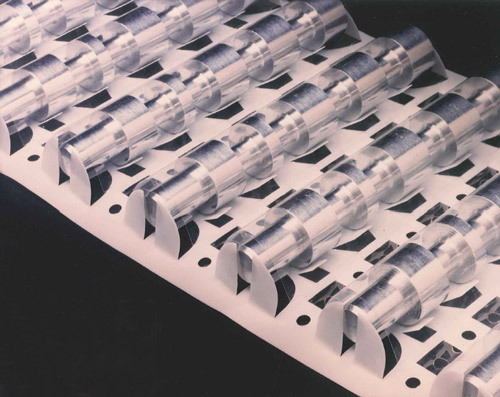 These interlocked tapes were then advanced to a position where the valve spools came off of the manufacturing line and were pneumatically pushed in to position by using the side opening of the tape. Once loaded, the parts were held in place by the cover and carrier tape on the top and bottom of the part. Specially designed tabs were strategically positioned on the edge of the tape to secure the part in place. The valve spool was protected during shipping and handling and then presented to a robotic arm using a GPAX Ultrafeeder. The cover tape was removed as the part was advanced in to position allowing for automated assembly.